Commander's Update Briefing at Camp Kengun, YS59, January 28, 2010. U.S. Army Pacific photo. Yama Sakura, the biennial U.S. Army – GSDF command post exercise, is currently underway on the southern Japanese island of Kyushu. Held every other year since 1982, Yama Sakura 59 is the 29th iteration of the joint exercise. 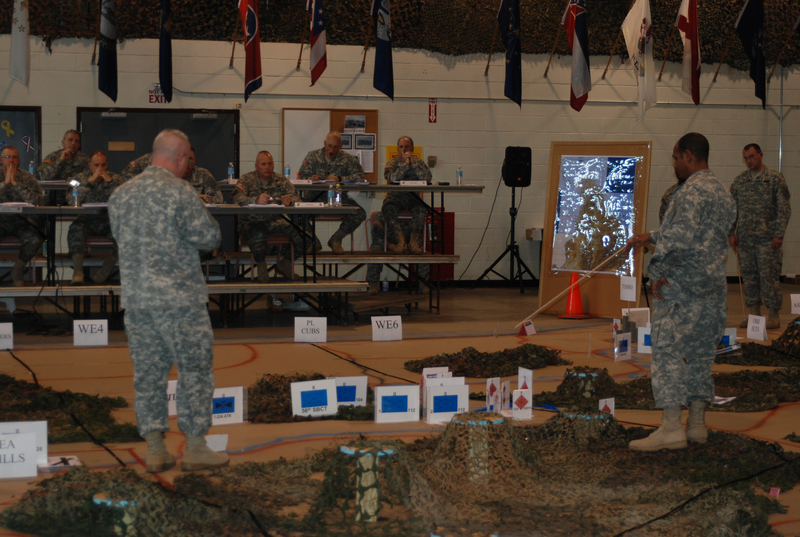 This year the exercise is at the GSDF Western Army headquarters of Camp Kengun, Kumamoto, Japan. Yama Sakura exercises traditionally involve the U.S. Army assisting the GSDF in repelling an attack on Japanese territory. According to U.S. Army Pacific, Yama Sakura 59 involves a full-blown invasion of Kyushu, complete with ballistic missile attacks and special forces warfare. “Other details are classified”, a U.S. Army spokesperson told Japan Security Watch. The exercises shift back and forth between army bases all over Japan, involving whichever GSDF army responsible for that region. Yama Sakura 33, held in 1999 at Camp Asaka, involved a fictitious nation code-named “Orangeland” landing two hostile armies in northern Japan and driving on Tokyo. YS 33 involved Japan’s Eastern Army, also based at Asaka. Yama Sakura 51, held in 2007 at Camp Itami, involved the Japan’s Middle Army. Yama Sakura 57, held in 2009 at at Higashi Chitose, involved the Northern Army. The ongoing Yama Sakura 59 involves the Western Army, headquartered at Camp Kengun. Yama Sakura 57. Click to enlarge. This photo, via the New York Army National Guard, gives some kind of idea what goes on at a Yama Sakura exercise. The basketball court-turned-terrain map depicts northern Hokkaido–note the map in the background of the northernmost peninsula. Also note the only identifiable town on the map is Teshio, which is right on the coastline, and which seems to be the staging area for U.S. elements. Farther south, in the center of the photo, the 56th Stryker Brigade, Pennsylvania National Guard is in contact with a hostile mechanized infantry division on what appears to be the outskirts of the town of Enbetsu. There is a certain mentoring aspect of these exercises. In YS33, for the first time U.S. Army units restricted themselves to rear-area support and deep battle missions (artillery and attack helicopter), letting the GSDF handle the bulk of the fighting. In YS57, the GSDF was instructed by retired U.S. military officers, called “senior mentors,” who came from the Battle Command Training Program (BCTP) that provides command and battle staff training for brigade, division, and corps commanders. The exercise is also a chance for U.S. personnel to experience a slice of life in Japan. U.S. personnel stay in Japanese homes, try on kimonos, climb mountains, pound mochi, and do all kinds of Japanese things. Recent Yama Sakura exercises have usually involved the U.S. Army’s I Corps and, due no doubt to the operational tempo of the Regular Army, a high number of U.S. Army National Guard units. U.S. units involved in YS57 included 42nd Infantry Division (New York National Guard), 29th Separate Infantry Brigade (Hawaii National Guard), 169th Fires Brigade, (Colorado National Guard), 138th Fires Brigade (Kentucky National Guard), and 185th Theater Aviation Brigade (Mississippi National Guard). Regardless, watching the videos and flipping through the photo albums, one notices a high proportion of combat patches (right sleeve) among US Army and National Guard units. More information on Yama Sakura 59 as Japan Security Watch gets it.